A road and bridge are closed after a roof partially collapsed at an abandoned mill in Pawcatuck and landed in the Pawcatuck River on Monday morning. Stonington Police and the Pawcatuck Fire Department responded to the Stillmanville Mill on Stillman Avenue in Pawcatuck after getting a report of a partial roof collapse during the storm. The mill, which is on the Connecticut-Rhode Island state line, is old and has been abandoned, according to police. It was formerly the Connecticut Castings Company, town documents show. Police said the back wall on the top two floors of the building collapsed and the roof collapsed on itself. Part of structure that collapsed landed in the Pawcatuck River, according to First Selectman Rob Simmons. The Connecticut Department of Energy and Environmental Protection has been contacted. 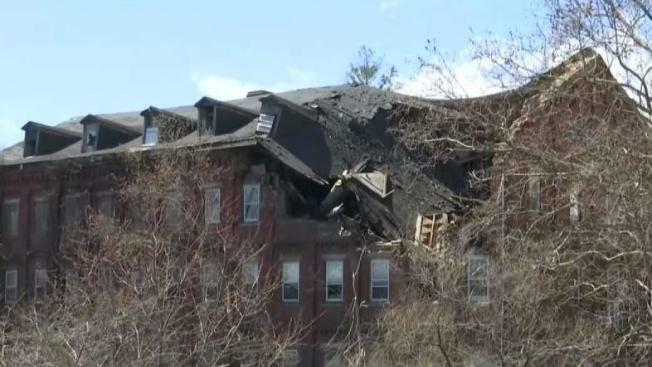 Officials met Monday to discuss what to do with the building and determined a portion of the building was unsafe and needed to come down. The town applied for and was granted approval to take the building down on an emergency basis. A demolition crew is expected as early as Monday night to begin the work. Town officials said the building is continuing to collapse internally and they are concerned that more debris could fall into the river. If the structure fails, the dust cloud could present a public safety concern. While a final report is not yet complete, the fire chief believes the collapse may have been caused when the building was struck by lightning. The abandoned mill, which dates back to 1848, according to the property listing report from the Town Assessor's Office, is privately owned and has been since 2006. There is also tax lien on the building and the roof of the building has been deteriorating for some time. The town has tried to contact the owners repeatedly, but they have not gotten a response, Simmons said. The Town of Stonington offered the building on a tax sale last year, but there were no bidders, Simmons added. Stillman Avenue and the Stillman Avenue Bridge, which is between Connecticut and Rhode Island, are both closed. Police said roads could be impacted for 24 hours.